It was on this day that a Welsh squire, Llywelyn ap Gruffydd Fychan, was gruesomely executed for thwarting the efforts of King Henry IV’s forces to squelch Welsh resistance to English rule. First, the man’s stomach was cut out and cooked in front of him. Then, he was hanged, drawn and quartered. The torturous execution took several hours before he succumbed to death. Then, a grisly postscript: his salted remains were sent to other Welsh towns to deter Welshmen from opposing the king. Henry IV has been crowned King of England after overcoming the unpopular Richard II. Henry had his predecessor imprisoned and killed, then displayed at St. Paul’s Cathedral to prove to his supporters that he was gone. Little surprise much of Henry’s reign was spent defending himself against plots, rebellions and assassination attempts. One rebellion? That of Owain Glydwr, who declared himself Prince of Wales in 1400. This didn’t sit well with the new king. Armed men were sent out to find this treasonous Welshman. Found them they did, though perhaps they wished they hadn’t. In the summer of 1401, on the slopes of Pumlumon, Owain Glydwr crushed Henry’s army. This, too, did not sit well with the king. Were strangely clamorous to the frighted fields. Which calls me pupil, or hath read to me? Henry then led a huge army, arriving in Llandovery, to capture this meddling countryman prince. It was here that the English military met a 60-year-old man. A land owner from Caeo, his name was Llywelyn ap Gruffydd Fychan and the English army strongly suggested he assist them in helping locate Owain Glydwr. Llywelyn agreed. Little did the English know, as they chased Glyndwr, that Llywelyn was taking them in the wrong direction. He had two sons, did this Llywelyn, in Owain’s army. Though he knew he’d undoubtedly pay the ultimate sacrifice, he would not betray the Welsh people and his own family but leading the English king to the insurrectionists. And so he led the English army on a wild goose chase. For weeks Llywelyn lead the king and his forces through the uplands of Deheubarth. All the while Owain and his men made their escape the opposite direction to consolidate, grow, and fortify. The king’s patience became taxed. He began to see that Llywelyn was not taking them to their man. Angrily, the king drug Llywelyn to the town of Llandovery. In front of the castle gates, there in the town square, he was disemboweled and dismembered. Though Glyndwr’s war of liberation fizzled out, Owain was never captured nor betrayed. Fast forward to the year 2001. 600 years after Llywelyn’s execution, a sculpture is erected. 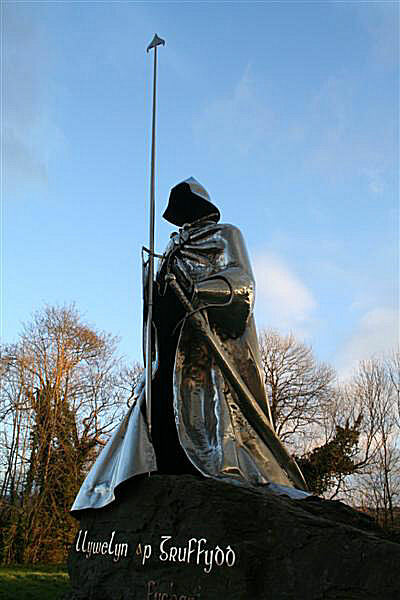 Standing 16 feet tall, erected by the castle he died in front of, is a statue of a cloaked figure, spear and shield in hand, atop a stone base inscribed with Welsh verse. It is he, Llywelyn, commemorating his ultimate sacrifice. 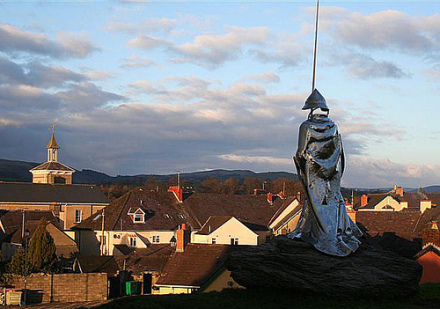 Llywelyn’s striking steel statue stands watch over Llandovery. Images (c) Canis Major and stused with permission.